Would you like to learn more about the members of the Language Team? Not so far in our distant past, Biigtigong Nishnaabemwin resonated throughout our community and our traditional lands. Our homes, schools, canoes, playgrounds, meetings, ceremonies, and everything around us resonated with the spirit of our ancestors. Our existence was experienced through our language’s embedded worldview. Our relationships with each other, with our Universe, and with our spirit world, were built on our understanding of the world as Nishnaabeg. Our world was perceived and expressed through our language, through our unique connection with our world. Our language was alive and well. Our history is similar to the histories of our relations throughout Turtle Island. As individuals, and as a people, Nishnaabeg have experienced devastating effects from our colonial history and the threats of external forces. Dispossessions and alienations from our ancestral lands, from our languages, from our family and community social structures, from our governance systems, and from our culture, have all contributed to what Dr. Leroy Little Bear (2009) calls our fragmented worldview. These external forces, such as the Missionaries and the Government, created strategies aimed to “kill the Indian inside of the child.” Strategic efforts aimed to remove our language from our world, separate us from our language, and wipe out our identity, in a deliberate attempt to create within Nishnaabe people an artificial sense of who we are as a Nation. Our language suffered appalling damage from these calculated strategies. As a result, the entire foundation of our identity as Nishnaabeg was significantly altered. Our entire world was changed. Language decline in turn resulted in a decline of everything we held sacred. Our elders, despite experiencing the direct negative impacts of these strategies, challenge us to determine our renewed path forward to ensure the continued existence and celebration of our Nishnaabe language, culture and practices. Our elders were up against unspeakable negative forces; and with fight and resiliency, they’ve successfully managed to hold on to some our traditional ways for our generation to experience. The power and responsibility to continue the struggle of our elders rests in this time and with us. We, here and today, are challenged with the task of ensuring that our children live a more Nishnaabe life than we do. Over time, our Nishnaabe language became invisible and eventually non-existent in our homes. Our language was no longer being passed down in a home setting. Our classrooms became the only means for our children to hear our language. However, external forces again controlled this environment. The language curriculum and methods of teaching, imposed upon us, were not conducive to effective language programs. We were controlled by Indian Affairs, the same body responsible for much of the historical traumas imposed on our people. In spite of these controls, our history speaks to the love for and commitment to our children by our Biigtigong Nishnaabe speakers. Charlie Twance was one of the first language teachers who spent time in the school. Dedicated to making positive impacts, Charlie diligently taught our language at the elementary school. Charlie was followed by a succession of individuals who loved the language and loved our children and wanted our young ones to experience our language. Individuals, such as Myra Michano, Lambert Nabigon, Irene Moses, Rose Moses, Thelma Nabigon, Collette Goodchild, Delphine Nabigon, Caroline Deschamps, Diane Richmond, and Shirley Michano, have been contributing to our collective efforts to ensure that our children hear and appreciate Nishnaabemwin. Although our strategies, here in Biigtigong, created an appreciation and respect for our language, we were not successful in creating understanders or speakers of our Biigtigong Nishnaabe language. As a result, we continued to see language decline throughout the community. Our children left our schools with memorized phrases, which they eventually forgot. Despite the love, commitment, and hard work of these individuals and others, our strategies were not working – especially if speaker creation was the goal. We were faced with this question: Why were we not creating understanders or speakers of our language? We realized that our language would definitely become extinct if we did not find a way to create speakers. Already being a big advocate for language and for our Nishnaabe ways, Cindy Fisher, Biigtigong’s Education Director, returned home from an event with a fire and a renewed sense of hope in the dream of hearing our playgrounds filled with the sounds of Nishnaabemwin. She believed that our language would instill a strong sense of identity and a pride so strong, that our children could accomplish any goal they set. Cindy wanted our children to live and experience the world as Nishnaabeg, through the eyes of our language. Cindy got to witness first hand the results of immersion and was impacted by the power of immersion. Upon her return home, Cindy set out to spread the hope of immersion and expressed that with immersion we could finally create understanders and speakers of Nishnaabemwin. This is where our immersion story begins. Cindy Fisher saw and felt the power of immersion. And, with conviction, she set forth the path for immersion in Biigtigong. To Cindy, creating speakers would be one of our greatest acts of decolonization and reclamation of our collective Nishnaabe being. At this time in our history, three main ingredients were discovered for successful language revitalization. First, we believed, along with our ancestors, that language was critical to our essence and should be passed on. Second, we acknowledged that our efforts to date had not created Nishnaabemwin speakers nor understanders. And finally, we believed that language immersion would provide the means to successfully create new speakers. We were on a new path to address the devastating impacts and losses that resulted from the colonial attacks on our people. We were on a path that would allow us to reclaim our language and reclaim our identity as proud Nishnaabeg. Cindy Fisher brought the gift of immersion to our community. 1. The state of the language in the community (number of fluent speakers, functional speakers and understanders, including other demographic information, such as age). 2. Evaluation of past and current language efforts. 3. Personal values, beliefs and feelings towards the language. 4. Ideas and direction regarding language loss and language revitalization. 5. Levels of support for Immersion-based Nishnaabemwin instruction. Every household in the community was provided a copy of the survey. Surveyors visited each home to explain the survey and provide instructions how to complete the survey. Some opted to complete the survey on their own and others requested the surveyors personally conduct the survey. The participation rates for this survey were high. The results were tabulated and formally presented to the Education Committee, Chief and Council, and the community. Additionally, the results were posted on the picriver.com website until last year (2014). The results clearly demonstrated that our language was headed for extinction. We had only seven fluent speakers and had not created any new speakers since their time. A significant portion of our population (those born prior to 1950) could produce some speech (functional) and understand the language. Additionally, we were not creating any new understanders of the language. Language was no longer being transmitted from generation to generation; English was the primary language being used in the home. The community indicated strong support for the revitalization of our language and indicated this should be a community priority. Most individuals wanted to acquire their language and 95% wanted their children to speak Nishnaabemwin. Immersion-based programs were strongly supported. Participants saw language as fundamental to the personal identity of every individual and to the identity of the community. They felt language loss contributed to the loss of culture and the uniqueness of our worldview. Reclaiming our language, our community’s traditional name, our cultural practices, and our governance practices, were identified as core factors to our Nation building efforts. Finally, the community believed successful language revitalization must involve all of the resources within the community, including the membership. The information obtained from this survey was used to develop our Language Revitalization Plan. The community was actively engaged in the assessment of our language and in identifying our path forward. Through the creative work of four summer students, the community enjoyed two unique language projects. The team (Juanita, Sarah-Jane, Shanna, and Tristan) produced a language revitalization video highlighting core aspects of successful language strategies. Focusing on topics such as language loss, second-language acquisition, language immersion, and language usage, they provided a well-researched education video. An innovative initiative engaged the community in our efforts to revitalize our language. A “Commercial Contest” attracted several video submissions promoting the importance of our language. Delores Courchene’s commercial was voted as the winner. She expressed her concern and fear for a world where our children might never hear, let alone understand or speak, their own language. She conveyed the importance of Nishnaabemwin to our identity as Nishnaabeg. Delores advocated for making language revitalization a priority in our lives and in our community. 1. To create within the Pic River First Nation highly proficient adult second language speakers of Anishinaabemowin. 2. To create within the Pic River First Nation highly proficient, balanced bilingual children socialized in Anishinaabemowin. 3. To promote and support the greater use and visibility of Anishinaabemowin within Pic River First Nation. 4. To create partnerships and organizational linkages that facilitates collaborative efforts to develop and implement the Pic River First Nation Language Plan. 5. Pic River First Nation Revitalization Plan will be implemented and updated under the direction of an effective governance and management model. 6. To assist members of our greater Anishinaabeg Nation in their quest for language revitalization by providing them language acquisition resources and opportunities. Our language revitalization plan is intended to be a long-term strategy. With each generation we have moved further away from our language, from the worldview and values embedded in our language, and further from the beliefs and practices we share as Biigtigong Nishnaabeg. Language revitalization will bring us back to seeing and experiencing the world as Nishnaabeg. The Education Department contracted JP Montano and Barbara Nolan to deliver a training program to the elders and to members of Council. Nestled in the old Head Start building, our elders diligently attended these weekend programs, which occurred over a period of several months. Concerned for their language, our elders committed themselves to learning how to revitalize our language and create second language speakers. Our elders learned about the experiences of other Indigenous Nations who successfully revitalized their language from almost a state of extinction. Inspiration, hope, and successful models were the gifts received from the Maoris, Hawaiians and French Canadians. With this new knowledge, our elders helped establish our vision to create speakers of Nishnaabemwin and develop a long-term plan to ensure our language remains alive in our community. A condensed five-day course was also delivered to the staff and community. The purpose of this training was to provide the staff with the basic knowledge of the models and methods being used in our language revitalization efforts. Effort was made to ensure that we all shared a common understanding of where we were headed as a community. Lambert Nabigon, Thelma Nabigon, Collette Goodchild, Rose Moses, and Irene Moses, embarked on a new adventure to acquire skills to pass on their language. Enrolling in a accredited college program, designed and taught by JP Montano and Barbara Nolan, our elders committed to learning the ways of immersion. For almost a year, they travelled eleven hours (return) to attend weekend courses. These language supporters gained a greater understanding of what is required to pass on one’s language using immersion-based methods. This initiative was intended to bring Biigtigong Nishnaabemwin via immersion into our classrooms and into our children’s spirits and their language acquisition devices (i.e., their LADs). In an effort to reach the adult population, an adult immersion program was also established. The goal was to provide on-site immersion and record the sessions. The long-term goal was to ultimately collect 2,000 hours of Nishnaabemwin immersion. An experienced immersion instructor who was a highly proficient speaker of Nishnaabemwin delivered the program. The program was supported by the younger generation who wanted to acquire Nishnaabemwin and believed in language immersion. The elders supported the goal of collecting 2,000 hours of immersion instruction. They respected the proficiency level of our hired instructor and acknowledged her gifts in providing quality immersion instruction. The elders expressed concern that the program was not being delivered in Biigtigong’s dialect. Acknowledging that the two dialects were about 80% the same, our elders wanted our attention to be placed on our dialect. The community thanks Phyllis Williams for modeling quality immersion instruction and gifting us with a greater understanding and appreciation for immersion. Based on the direction of our elders, we had to go back to the drawing board to come up with strategies to explore the revitalization of Biigtigong’s dialect of Nishnaabemwin. The language efforts were put on hold, allowing the necessary time to accurately assess the situation. Rhonda LeClair has been another advocate for our language. Understanding the importance of language and wanting to make meaningful contributions to the revitalization efforts, Rhonda coordinated summer language camps. Aiming to instill a greater appreciation for the language and create an awareness of the beauty of our language, the camps offered opportunities for our members to participate in cultural activities and hear Nishnaabemwin. We are thankful for the visiting speakers, who so willingly shared their language, and we are grateful to our speakers and elders for supporting another effort to revitalize our language and reclaim our identity. The language revitalization plan and implementation strategies needed to be revised after our elders provided direction to focus on Biigtigong Nishnaabemwin. Understanding the limitations and challenges with this undertaking, we are embarking on one of our most important journeys together as a community. 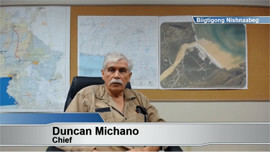 Reclaiming Biigtigong Nishnaabemwin begins. The choice to let Biigtigong’s dialect of Nishnaabemwin live or die ultimately rests in the hands of Biigtigong Nishnaabeg. At our annual community Moose Camp in 2013, we announced the new focus of our language revitalization strategies. Our elders of today provided strong direction to take on the challenge to bring back Biigtigong’s dialect of Nishnaabemwin. On our lands, where our ancestors sustained life, we connected our history and our future. We heard the voices of Dan, Lawrence, Moses, Louis, Ernest, Moses and Mike resonate throughout our camp. The spirit of our ancestors was felt in our hearts and Mother Earth once again heard our language of Biigtigong. Through the spirit of our grandfathers and great-grandfathers, we committed to this challenge and honour their fight. At our community strategic planning session held in April 2014, we once again placed our language as a pillar of our overall strategies of Biigtigong Nishnaabeg. Reclaiming and asserting our belief in the power of our values, our culture, and our ability to control and govern our own affairs, was reiterated during these sessions. An update on the reconstruction work was provided. Additionally, we seized the opportunity to further consider additional opportunities that follow successful language and culture revitalization. Over the past two years, our team has been working diligently on the reconstruction work of Biigtigong’s dialect of Nishnaabemwin. Understanding the complexities of the issues and challenges, our team utilized all available resources to assist in completing this task. Myra, who has been the biggest advocate for Biigtigong’s dialect, provided us with the vision and continually reminded us of the importance of our own dialect and our identity. She provided inspiration and was always a source of encouragement and direction. Cecil and Art sat with JP for countless hours examining linguistic research and studying the structure and grammatical breakdown of Nishnaabemwin and Biigtigong’s language. With grammar-bridging from a related dialect (Odawa), research, and determination, this team has successfully completed the task of reconstructing Biigtigong’s dialect. On September 17, 2015, the details of this work will be presented to our community. We will discuss in-depth the processes and methods of reconstruction which we utilized, and we’ll highlight some notable grammatical features of our dialect of the Nishnaabe language (i.e. morphology, orthography, phonology, etc.). Once this information has been shared in an in-person environment with our people, the information will then become available on biigtigong.com. We have much to celebrate. Our dialect of Biigtigong Nishnaabemwin has been reconstructed and documented. We have honoured our ancestors, we have continued their fight to ensure that our language feeds our spirits, connects us to life, and provides direction in living our Nishnaabe lives. We have something to build on, we now have the opportunity to create speakers of Biigtigong Nishnaabemwin; this was not an option two years ago. Our road forward continues with many challenges and the effort of the entire community is critical. We have a long journey ahead of us developing the resources and establishing the infrastructure to facilitate the creation of speakers of Biigtigong Nishnaabemwin. Our history tells us we can do this, that we can make Biigtigong Nishnaabemwin alive and thriving once again.